Omar (centre) and other police officers with the 11.058 kilograms of syabu. 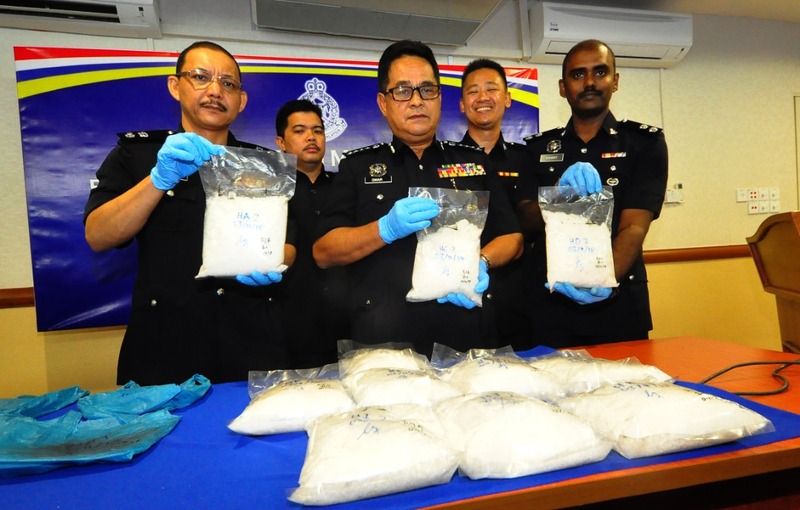 KOTA KINABALU: Three suspected drug traffickers were detained by police and 11.058 kilograms of syabu worth RM552,900 was seized last week. Sabah Commissioner of Police Datuk Omar Mammah said the arrests were made during an operation by narcotic police from Bukit Aman at Jalan Tungku in Lahad Datu at 6.30pm on November 2. “Police spotted two suspicious vehicles, a Perodua Bezza and a Perodua Myvi, and as they approached three men, they ran away. “Police apprehended the three men and upon further investigation and interrogation, the suspects led police to Jalan Seri Melor Tinggayan in Semporna where we found a brown box containing 11 packets of crystal-like substance believed to be syabu inside an Isuzu D-Max vehicle,” he said. Omar said the seized drugs weighed around 11.058 kg with market price of RM552,900. According to Omar, police investigation revealed that Sabah is believed to have been used as a transit point by drug syndicates to bring in drugs before being smuggled to neighbouring countries. Police have since detained the suspects, age 15 and 42, for investigation under Section 39B of the Dangerous Drugs Act 1952. If found guilty, they will face the death penalty.